"The elections will see over 1.79 lakh new voters on average in each constituency. Of them, about 24 per cent, or around 43,000, will be first-time voters, in the 18-19 age group. That’s a significant figure, as the winning margin was less than this in 226 Lok Sabha constituencies in the 2009 elections." 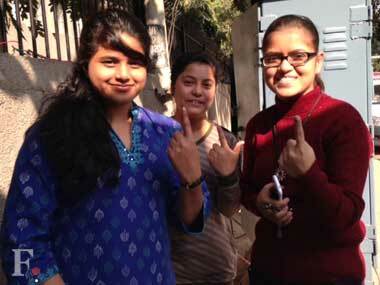 First time voters in Delhi. Shruti Dhapola/Firstpost. As the IE report points out, the BJP with its development plank being relentlessly promoted by Modi, seems to be delighted by the new findings. However, this seems to be cause for worry for not only the Congress, but the freshly-minted Third Front. While, evidently, the Third Front will not be driven by the force of either one personality or party and will bank on the component parties' individual influence in the respective strongholds, none of the participants are known to have the kind of youth connect that the BJP seems to be building and the AAP started off with. Despite its no-show in Delhi, AAP with its high-on-idealism rhetoric might just manage to make a dent in the upcoming polls. The BJP, on the other hand, will be glad that they can exploit their development plank to the hilt with the new, first-time voters. Read the complete IE article here. 190,000 young voters for every LS seat: Bad news for Third Front?